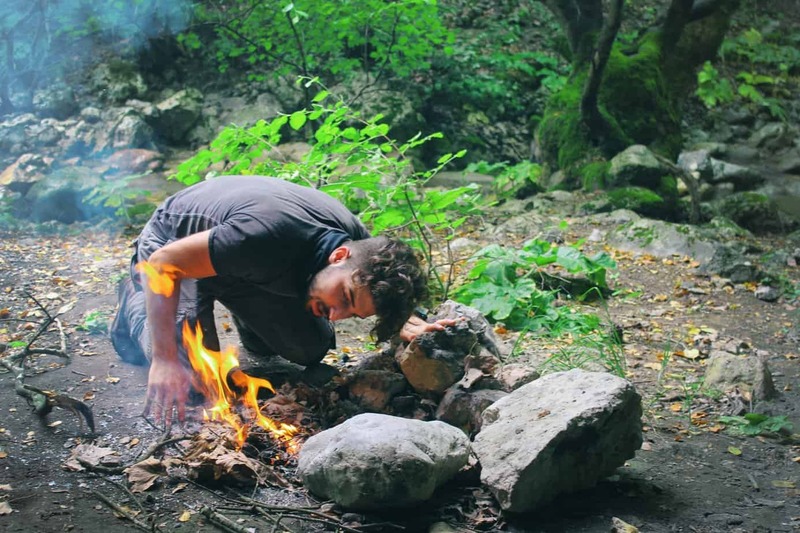 » Hilleberg Allak 2 Review [2019 UPDATE]: Is it Versatile Enough? Hilleberg Allak 2 Review [2019 UPDATE]: Is it Versatile Enough? With 45 years of experience making tents, it’s easy to see why Hilleberg is a well-respected brand. This company has really mastered the art of creating shelters- you can’t go wrong with one of their models. They have quite a selection of tents on the market which can make shopping for one a bit difficult. If you are specifically looking for a 4 season tent made for two, a good tent to look into is the Allak 2. This dome tent is completely freestanding and is as tough as they come. If you want to save on weight but need a shelter that can handle harsh weather and the abuse that comes with heavy use, check this one out. Where to Buy the Hilleberg Allak 2? The Allak 2 looks simple enough but Hilleberg really made special attention to the design of this model. 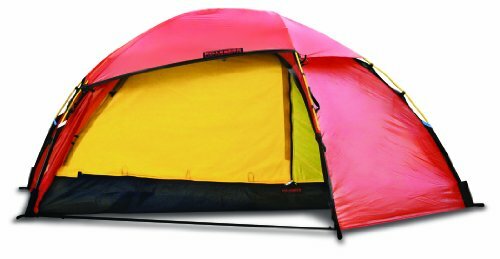 This tent has everything it needs to perform well under a range of conditions without a bunch of unnecessary features that would take away from the workhorse nature of this model. Reading through the feature list and seeing the materials used in it’s creation, it’s not surprising that the Allak 2 is a popular option for serious outdoor enthusiasts. The tent might be small but it has quite a few advantages over the competition. Hilleberg made this tent the perfect size for two- just enough space that things aren’t uncomfortable, but not excessively roomy that is adds unnecessary weight. The company created this model to function as a lighter weight, freestanding version of their Staika tent. A major selling point for this model is it’s freestanding capabilities. Even the vestibules are freestanding. Outdoor enthusiasts who often find themselves having to pitch a tent in rocky, sandy or otherwise difficult terrain need a tent that can remain stable and strong. For that reason it is ideal for kayakers, paddlers or others who spend the day on the water but want to set up their shelter on the bank. 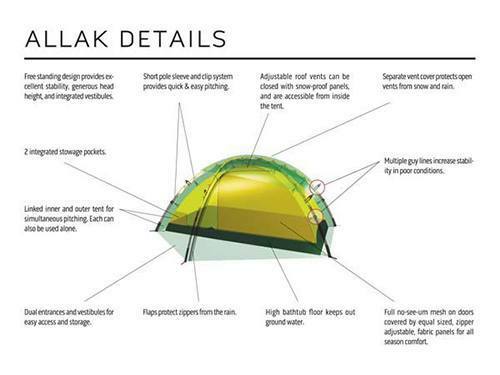 The Allak 2 dome shape is incredibly sturdy and the sleek shape is ideal for harsh weather conditions. This tent can handle light snow loads without an issue as well. If you are looking for something a bit bigger, I’d recommend checking out the Tarra 2. The Allak 2 may be on the more expensive side compared to other 4 season double occupancy tents, but it’s understandable when you look into the type of materials and design Hilleberg put into this model. The main fabric on this tent is Kerlon 1200 which is a 30D high strength ripstop nylon treated with triple layer of 100% silicone for water and UV resistance on both sides. The inner tent is a basic 30D nylon also treated with a DWR coating, although it remains extremely breathable to allow for air exchange. Finally, the bathtub bottom of the tent is a 70D nylon with a triple PU coating, making it resistant to any normal damage. Special attention was given to the overall design of the tent. Since it is freestanding, stability and overall strength was a focus. The crossed pole design is easy to setup and gives the tent excellent reinforcement, even able to handle a moderate snow load overnight. 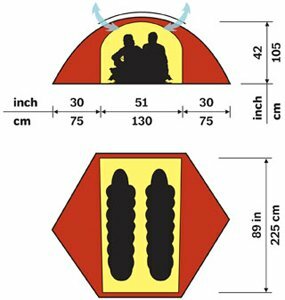 The shape of the tent is attractive but very functional as the dome shape was specifically chosen for weather resistance. The design of the Allak 2 is versatile as well. For example, if you plan on camping in very severe conditions or the possibility of heavy snow, you can double up on poles for maximum strength. Overall this is a very well-designed tent and is well worth the investment. At only 41″ tall with a dome shape, harsh winds will glide right over the Allak 2. Even though the tent is small and not as heavyweight as other Hilleberg 2 person tents, this model can handle tougher conditions than other brands. It is a true 4 season tent that is going to keep you cozy and comfortable in a variety of weather extremes. The bathtub style floor goes up quite high on the tent and is going to prevent any water or moisture from leaking in. This makes the Allak 2 ideal for wet weather, whether it’s spring showers or a slushy snow. The doors are made of No-See-Um mesh, which keeps out nasty bugs, but is also backed with fabric for trapping in heat. These fabric panels are zippered on which allows you to control how much mesh/ventilation you want in the tent. The actual roof vents can be opened and closed from inside the tent. These vents are covered for protection from snow, rain and wind. Addition water and wind protection comes in the form of storm flaps over the zippers on the tent. It’s difficult to find any faults with the Allak 2 but if you really search you’ll find that there are two complaints that some buyers find. The most common complaint of the Allak 2 is the price. 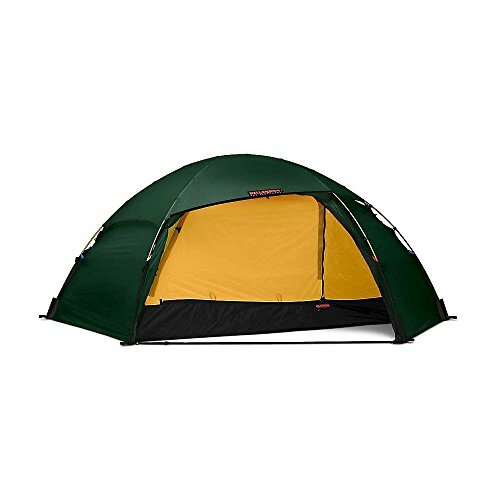 Although you can find this tent on sale for a better price, don’t expect to find this model new for less than $900 retail as of this writing. This is a lot of money for people who are casual campers or won’t use this tent year-round. Even those who camp often may find that the price is a bit steep for something that can only shelter two. The disadvantage of price also plays a part in this tent’s second downside. However, this listing frequently has discounts (worth checking). Weighing in at about 7lbs isn’t that bad for a 4 season tent for two but when compared to the price of the tent it is heavy. Compared to other two person tents on the market in the same category, the Allak 2 is on the heavier side and is more expensive. Also, consider that the footprint and any extra poles will add more weight. Hilleberg did make this tent easy to break down so two people can share the weight. The poles and the tent body are in separate stuff sacks. Hilleberg is an exceptional brand. Their tents are known for being very well designed, with incredible attention to detail and overall durability. It’s no surprise that the Allak 2 is a popular option that has glowing 5 star reviews. If you are someone that wants to invest in a tent that will give you peace of mind and reliability in harsh conditions, check out the Allak 2. OutdoorPlay: They typically have very competitive pricing, plus discounts for new customers. Check out the Allak 2 listing here. Moosejaw: Also worth checking out, Moosejaw typically has a good supply of Allak 2’s here + loyalty bonuses if you sign up for a membership.